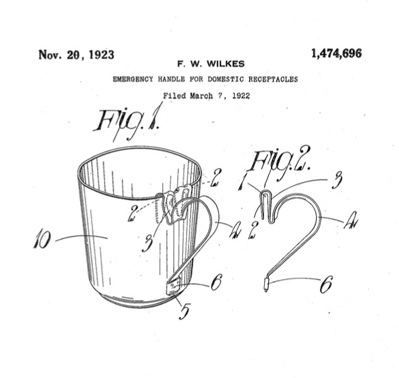 “Emergency Handle For Domestic Receptacles”, patented in 1922 by inventor Frederick Warren Wilkes of Birmingham, UK. Before disposability, before planned obsolescence, and even before mass production really entered its modern phase, there reined a different kind of material relation with broken objects. 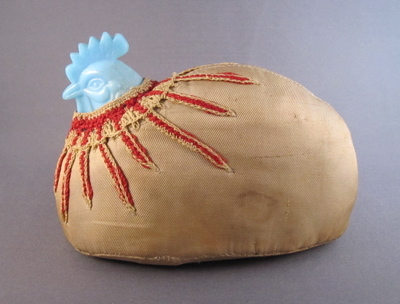 Waste historian Susan Strasser calls this ethos “stewardship,” characterized by handwork, repair, and making do: “We are not likely to revive the stewardship of objects and materials, formed in a bygone culture of handwork. But perhaps new ideas of morality, utility, common sense, and the value of labor—based on the stewardship of the earth and of natural resources—can replace it” (Waste and Want 2000: 293). Andrew Baseman’s blog “Past Imperfect” is making strides to knit together past instances of stewardship and present-day appreciation for the ingenuity and beauty of repair. Baseman, an interior decorator in Manhattan, collects what most antique dealers pass over. Determined to find examples for my new collection, I searched through antiques shops and flea market, asking dealers for pieces with early repairs. Although I explained that I was interested in the items for the repair itself, many dealers were offending at the notion that I thought they might be carrying less than perfect goods. Eventually one dealer said to me “Oh, you mean you collect “make-do’s”. I had never heard that expression used before but I soon learned that the term “make-do” is associated with items featuring, most commonly, folksy or crude home made repairs. I soon learned that I was not alone in my appreciation, as I met other collectors and dealers from around the world sharing in my passion for these often neglected antique orphans. A dictionary definition of “make-do” states: “something that serves as a substitute, esp. of an inferior or expedient nature: We had to get along with make-dos during the war.” The origin is from 1890-95, much earlier than I suspected. As the term seems to have a taken on a negative connotation over the years, I much prefer using the term “inventive repair” to describe the embellishments on the pieces in my collection. In the pictures that follow, you will see examples of my own flawed beauties amassed since my first purchase in 1983. In a New York Times article, Baseman repeats the sentiment: “I still haven’t found the proper word for these objects,” he said. “Make-do,” he believes, conveys a kind of second-class citizenship. 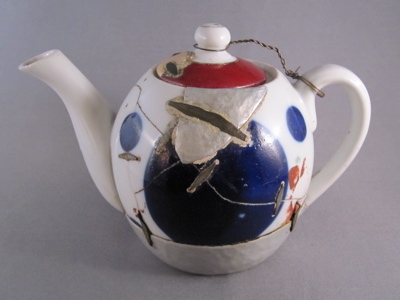 “When I think of a beautiful 17th-century teapot with a chased silver spout and jewel-encrusted lid,” he said, “the term just doesn’t sound elevated enough.” Marilynn Gelfman Karp, the author of In Flagrante Collecto (Caught in the Act of Collecting), calls them “poignant repairs.” The human element, rather than the machine aesthetics of mass consumption we are used to today, seems to be what draws people to these objects. “Past Imperfect, the art of inventive repair” is curated as a museum of past repairs. Yet, beyond the ingenuity and inventiveness of many of the repairs and the obvious expertise of the collector, one is struck by how the line between repair and creation starts to blur as repairs intervene heavily into the aesthetics, and even the utility, of many objects. 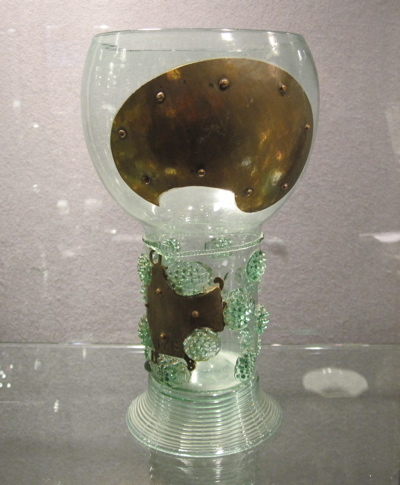 Two brass palette-shaped plates, convex on the outside and concave on the inside, have been riveted together to conceal a large hole in the center. From Past Imperfect. 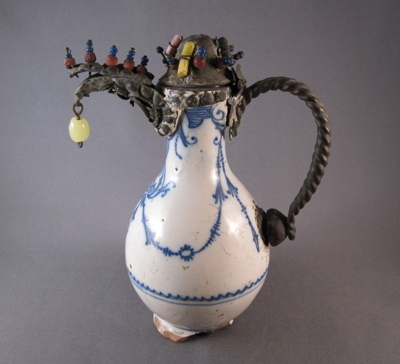 French Delft ewer, c.1690 Elaborate metal mounts with dangling glass “jewels” replace the original ceramic spout, handle and cover. 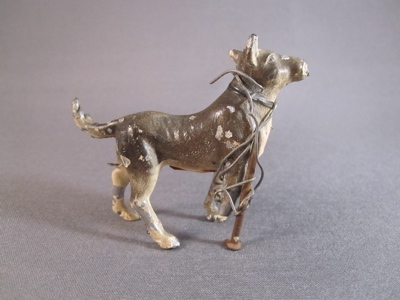 Cold painted cast lead dog figure, c.1930. A small nail and short length of wire replaces a tiny toy dog’s missing leg. 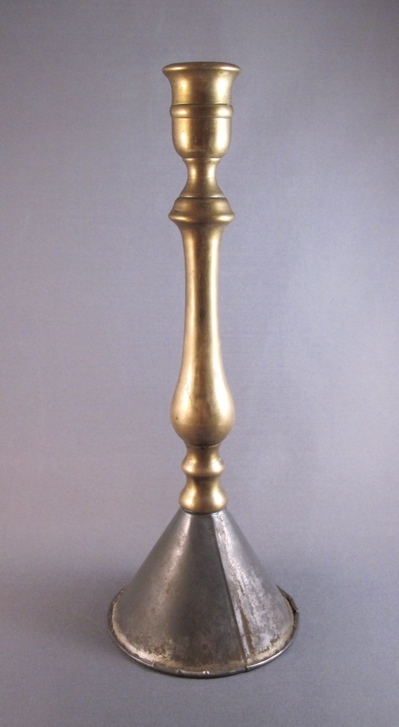 Brass candle holder, c.1880. The base looks as if it were made from a funnel. 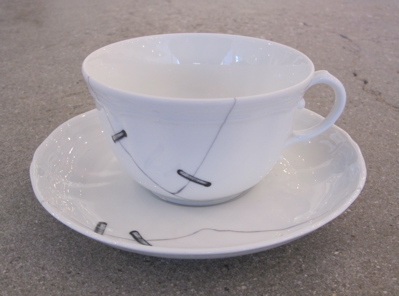 This is actually a faux repaired tea cup. These were created in 2010 by architect and product designer Paola Navone and feature printed cracks “repaired” with trompe l’oeil metal staples. The Past Imperfect collection has the potential to do some critical work. 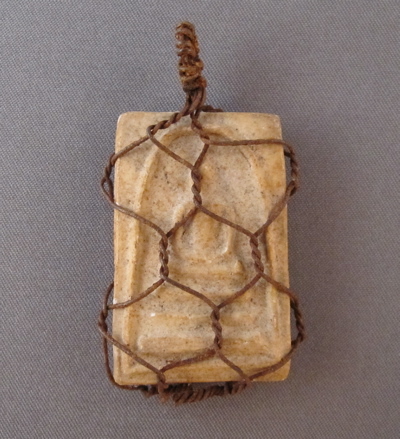 Museum and collection logic are premised on preservation. Yet, here are examples of repair that “preserve” materials along lines separate from authenticity and prioritization, the mainstays of art/design history. While some museums are bringing repaired items into their collections, often the repairs are authenticated and dated in parallel with the original pieces. I fear that the museumization of repairs takes the teeth out of some of their most useful critical work. The aesthetics that arise from practices of hacking, Jerry-rigging, and making-do are notable because the strength of their transport into the 21st century is not rooted in just their beauty or articulation of morals or values or politics of repair. Instead, they can work as a politics of critique by providing a counter example to material relations. If that counter example were to live, rather than be shelved and viewed from afar as precious objects, it would have more potential to work in the world. This is where the Fixers Collective, iFixit, Repair Cafes and la creation populaire come in. They do the living work of Inventive Repair, bringing some of Strasser’s call for present day stewardship into being. If this counter example were to actually scale, from the hobbyist or museum specialist to the mundane and everyday, then we might have a material revolution on our hands. 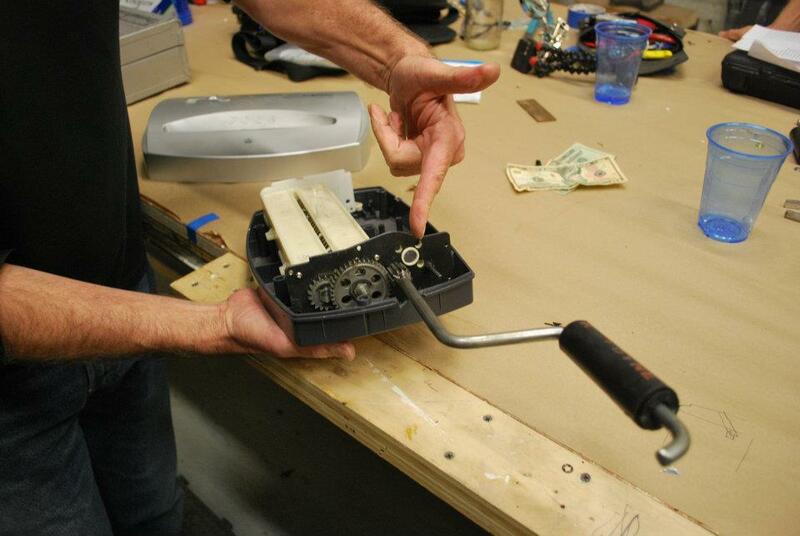 A present day inventive repair: a paper shredder gets a hand crank. Via Fixers Collective. Strasser, Susan. Waste and want: A social history of trash. Macmillan, 2000. Codrington Lippke, Andrea. 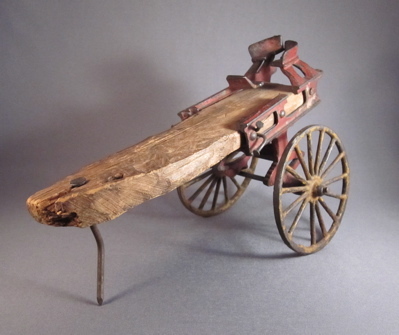 “In Make-Do Objects, Collectors Find Beauty Beyond Repair,” New York Times, December 15, 2010. Ellison, Chappell. 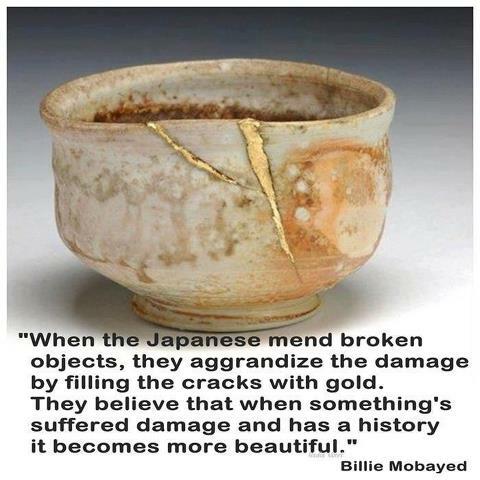 “Cracks and the Art of Repair.” Etsy Blog. March 26, 2012. This entry was posted in Aesthetics, Archives, Repair & Maintenance, Reuse and tagged aesthetics, collection, collections, DIY, fixing, inventive repair, make-do's, material culture, repair. Bookmark the permalink. I’m rather fascinated by the ‘inventive repair’, or visible mending as the rather fantastic ‘Tom of Holland’ terms it. I’m a (rather untidy) knitter and dressmaker in my non-work life, in the course of which I encountered ‘Tom of Holland’s visible mending work on textiles, specifically darning. It is the idea of mending in synthesis with creation that particularly intrigues me; that skill and craft can add more to something, at the same time as mending it and bringing it back into use.